This special parcel along the Rio Grande bosque was defined by two handsome stands of cottonwoods. The challenge was to fully exploit the potential for both house and site and to achieve the maximum integration of the two. Client Program / Desires: Strong connection with site and bosque to the west. Keeping the trees and character of the site. Interior spaciousness and natural light; wall surfaces and interior compatible with contemporary art collection. Large covered outdoor portal for warm season use. 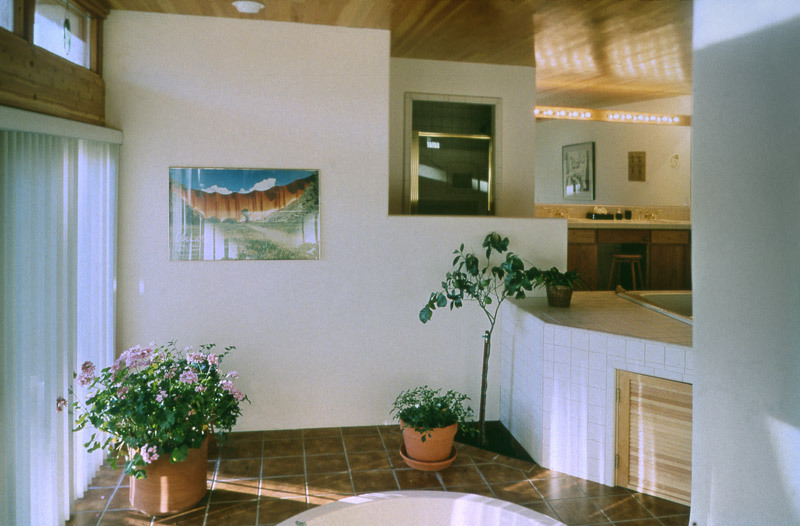 An upper level studio with views of the mountains east. 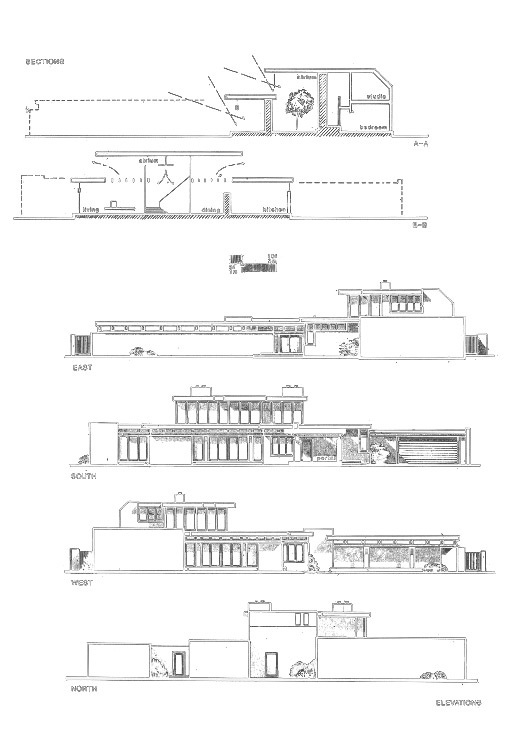 Passive solar qualities and energy efficiency. Privacy from the street. Site Solution: The major tree stands sit on berms along the front and back of the land. A partial clearing in the center posed an opportunity for a sunny yard. 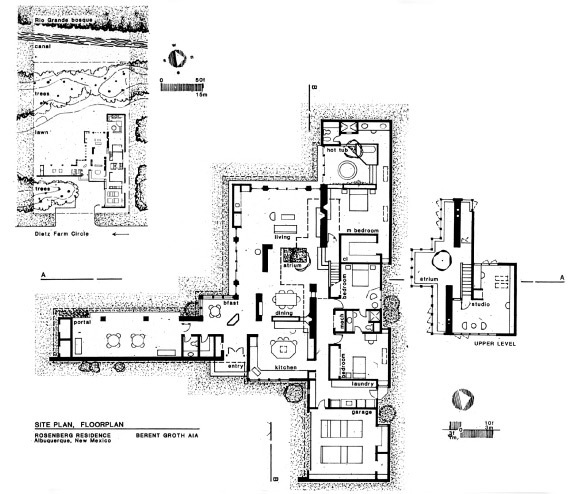 The dwelling envelope is nestled between treed berms and along the core clearing. 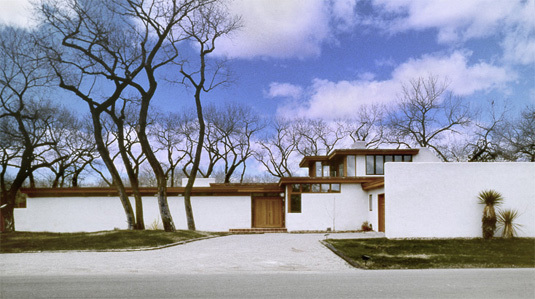 House Architecture: Strong horizontal lines of the house highlight the verticality of the trees. The upward thrust of the glassed central atrium and studio empathize with the trees' upward surge and crown. 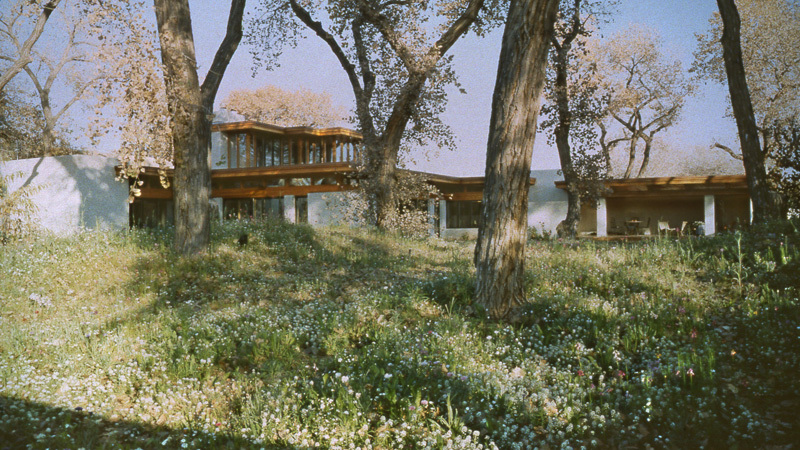 The house sits between the trees and opens to the center clearing on the south. Its position to the north and east creates a surprising amount of usable private outdoor space on a half acre lot. The covered portal serves to seperate the public front from private outdoor world. 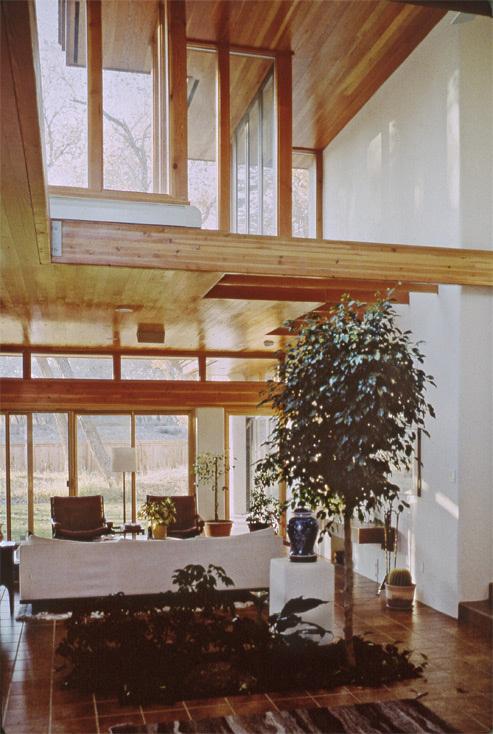 An interior two story atrium provides expandable dining space, views of tree canopies and controlled light capture. 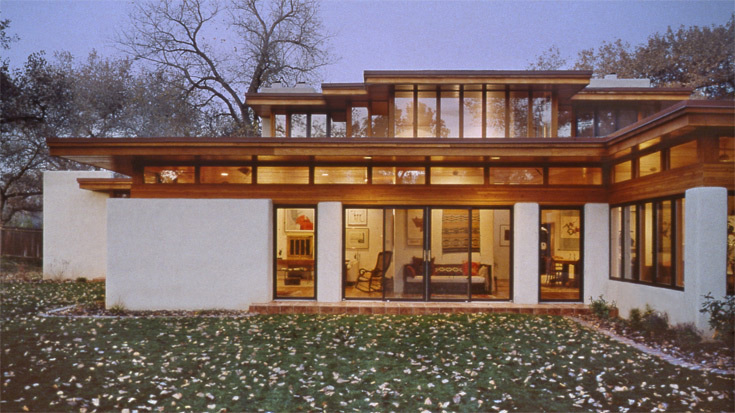 Solar Design: Glazing is concentrated for winter passive solar gain and views. 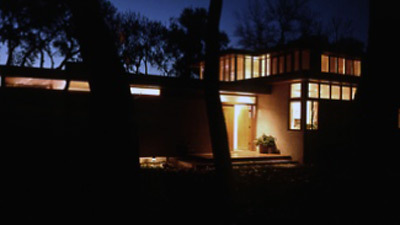 Cantilevered shade overhangs control the amount and times of light penetration. Carefully placed plastered thick interior masonry walls display artwork and serve as heat sinks along with tiled concrete floors. Energy Conservation/HVAC: Insulated low-e glazing throughout, oriented primarily to the south and east with deep overhangs. Trees shade west facing glass. 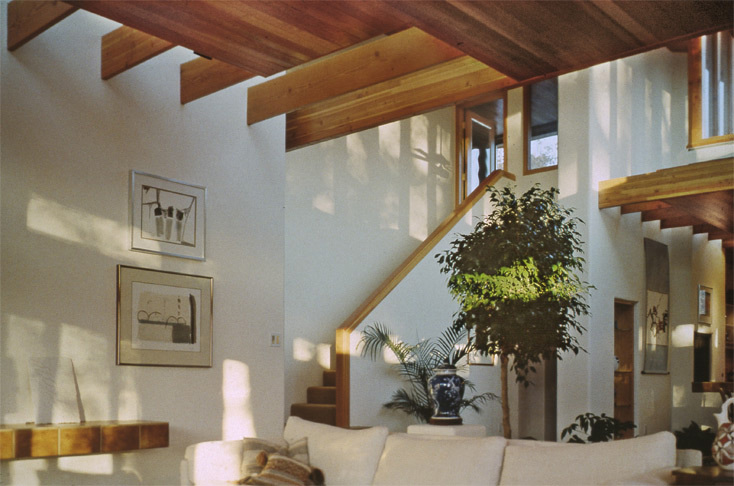 Operable atrium clerestory windows allow summer night time cooling. 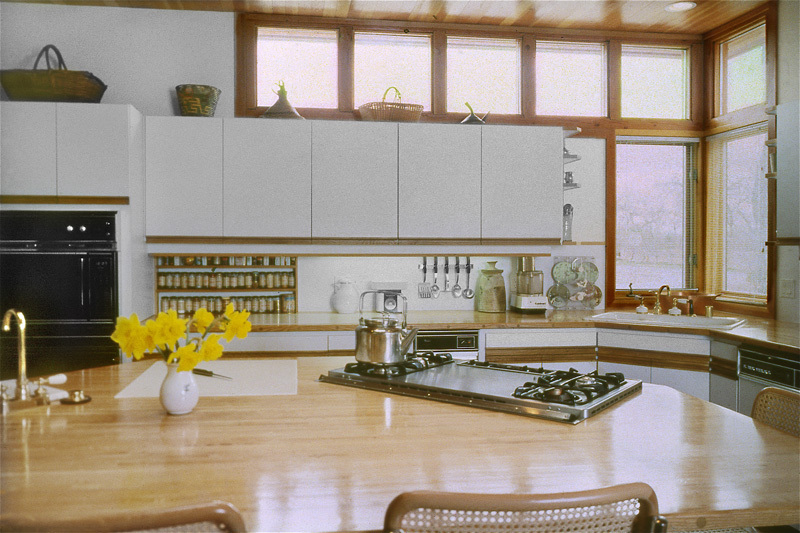 The house has natural gas radiant floor heating and R-35 roofs.